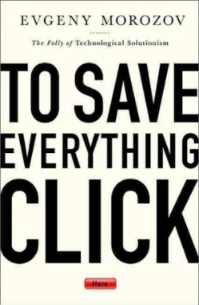 His second book, To Save Everything, Click Here, offers a more measured Morozov. There are still moments of hyperbole and some fairly brutal zingers, to be sure. (He describes McGonigal as “a bad parody of Mitt Romney” for example.) But the book carefully draws on a wide range of political, philosophical, and historical works about science and technology, and as such, Morozov’s arguments are firmly rooted in canonical, cultural criticism and not simply in an easy-to-dismiss curmudgeon-hood. The book identifies two main ideologies — “Internet-centrism” and “technological solutionism” — that permeate the tech industry, its PR wing the tech blogosphere, and increasingly government policy and thus our public and our private lives. “Internet-centrism” connects to Morozov’s earlier arguments in The Net Delusion and describes the tendency to see “the Internet” — Morozov uses quotations around the phrase throughout the book — as a new yet unchanging, autonomous, and inevitable socio-technological development and a master framework for how all institutions will supposedly operate moving forward. “Technological solutionism” is the related tendency to identify simple answers — in all domains, not just the tech sector — “before the questions have been fully asked” or the problems fully articulated. Morozov does not explore education technology at any great length in his book (the writing of which, I imagine, coincided with the unfolding and escalating MOOC hype — otherwise I’m sure he’d have had much much more to say, particularly as he spends a good amount of time in To Save Everything questioning “our new fetish for digital openness”). Nevertheless, his book does draw on the theories of several important education philosophers, including John Dewey and Ivan Illich, an intellectual heritage that should serve to remind us of the ways in which the theories of teaching and learning (not to mention schooling) are deeply interwoven into our formulations of democracy and public life. Even without Morozov addressing ed-tech solutionism specifically, one can readily recognize its existence in the examples he explores. Open government, data- and algorithm-based decision-making, the quantified self movement — none of these exist terribly far afield from ed-tech; all are, in fact, connected to many of the major trends that myself and others have identified in the sector. I would contend too that my ability to scribble “see also: education” in the margins throughout To Save Everything speaks to the ways in which much of ed-tech (as well as the journalism that’s been cultivated to cover it) easily fits into Morozov’s larger arguments about Silicon Valley: context-free, deeply ahistorical, and suffering from a poverty of theory but certainly not from a lack of ambition. Ed-tech solutionism is evident in the tools and particularly in the trade mags: where everything is disruptively innovative and wonderful and, oh hell yeah, well-funded; where — wow, thanks Stanford! — online education is a brand new development; where classroom practices get “gamified”; where learning to code is Sputnik 2.0; where teaching math is just like teaching reading is just like teaching programming is just like teaching physics — it’s all “content delivery,” right? — but in this brave new “Internet-centric” world, who needs teachers anyway when you have engineers, algorithms, autodidacts, and, of course, videos of Salman Khan?! The recent fervor in education and technology circles for “data” is certainly a case in point. More data — more tracking and sharing of student and teacher data and by extension evaluation of their “performance”; more algorithms devised from what’s being gathered — promises to make education more efficient, more accountable, more personalized. And it’s not just a promise either; it’s policy — an effort supported by established corporate players in education (textbook publishers, the testing industry, the software industry), by startups (funded oftentimes by those very corporate giants), philanthropic organizations (also funded by the same folks), and politicians (once again, follow the money). So here too, Morozov’s insights might be most applicable, helping to interrogate a growing fixation with data, modeling, and measurement — he uses predictive policing and the quantified self movement as his examples — and to raise questions about the means and the ends of efforts like the Gates Foundation-funded inBloom, along with all the various systems and practices -- RFID tagging, CIPA-mandated logging, LMS tracking -- that students are subject to, often without their knowledge, let alone their consent. The end that Morozov envisions from all this: the stripping away our democracy, if not our very humanity. So his book urges us to ask — of tech and, I’d add as well, of ed-tech: what exactly do we mean by optimization — optimized for what and for whom? Who builds and who audits the algorithms that purport to steer students forward through subject material? What subject material is important? Who says so, and why? Who wants to build more automated classroom software, more robot teachers, and why? Why is efficiency, particularly when it comes to learning, something we’d want to pursue? Why do we suppose that more data means better teaching, let alone means better learning? By what means? To what end? As the education system — and the ed-tech industry that is prepping itself to both serve and steer it — becomes more and more obsessed with numbers and facts and with building algorithms that both explain and shape it, are we sacrificing what Morozov (drawing on Martha Nussbaum) describes as the “narrative imagination” for a “numeric imagination”? “Where narrative imagination is self-reflexive — it’s painfully aware that in order to account for the world, it also needs to account for the observer—numeric imagination believes in objective, firm accounts of reality out there; these accounts are timeless and never expire.” Somehow, all that matters in the numeric imagination, are how well American students score on standardized test scores — as if that is a measurement that could ever capture the complexity of an individual’s learning, let alone an entire nation’s education system. But as politicians and policies and parents and headlines insist: numbers matter. Test scores matter. So ed-tech solutionism steps in to offer a (somewhat) new way to obsess over them — by testing and tracking students more regularly and rigorously, by metering their every mouse click, by acting as though students are machines themselves that can be installed, upgraded, recoded, and rebooted as the latest apps and algorithms might dictate. Constructing a world preoccupied only with the most efficient outcomes—rather than with the processes through which those outcomes are achieved—is not likely to make them aware of the depth of human passion, dignity, and respect. We don’t earn our dignity by collecting badges; we do it by behaving in a dignified manner, often in situations in which we have other options. Tinker with this spiritual pasture, and those options might go away—along with the very possibility of dignity. And my, how (ed-)tech loves to tinker. So what do we make of the tinkering? Utopian and dystopian readings likely see very different outcomes in these technological developments: a challenge to outmoded practices and institutions on one hand; privatization and profiteering on the other; personalized learning on one hand; a well-scripted, but ultimately scripted, curriculum on the other; open access and opportunity on one hand; surveillance and standardization on the other. How do we distinguish between ed-tech as solutionist marketing (what you hear in (ed-)tech blogs that gush uncritically about every new app and every new investment) and ed-tech as contingency-in-practice (the ways in which students and teachers have always MacGyver-ed together the tools that they need — hacks for inquiry and pleasure, despite a regime that might demand otherwise)? Because do so — distinguish, dismiss, agitate — we must. I’ve been told quite often that I’m too negative. Too critical. Too unsupportive of education technology entrepreneurship. Too loud. Too mean. And lately, I’ve wanted to retort, "Maybe. But I’m no Evgeny Morozov” — even though, truth be told, I think ed-tech desperately needs one. Ed-tech, once so deeply grounded in progressive educational theory and practice, has been largely emptied of both. There have been brave anonymous commenters here too that have suggested I’m too reliant on continental philosophy. That instead of being the “post-modernist wannabe ‘foucault’ of ed tech , I should “go teach a few years of K–12 with some real kids.” In such formulations, apparently teaching is distinct from theory, the classroom distinct from critique. Solutionism, no doubt, has far-reaching tentacles. Solutionism serves to foreclose critique. I have to imagine that Morozov has been similarly charged — too much “talk” and not enough “action” or something (laughable, if you know his background) along those lines. In some ways, Morozov predicts this criticism in To Save Everything when he contends that we have witnessed a “triumph of psychology over philosophy.” All the carefully crafted arguments he makes -- all the rich references to political and social theory -- matter for naught if someone can appeal instead to another field. And that’s clearly the case in education and ed-tech, where neuroscience (of both the armchair and academic varieties) claims that it can provide us with all we need to know about teachers and students, about cognitive development, competency, and their measurements. That triumph comes, in no small part, because psychology and neuroscience carry the markers of science and truth, while philosophy "merely" gives us agonism and contingency, neither of which can be packaged neatly into ed-tech policies surrounding curriculum standards and assessments, neither of which make us turn, when looking for a quick and easy solution to the woes of the public school system, to an app in the education section of iTunes. Am I too negative? Is Morozov? Maybe. If you prefer, you are welcome to bask in the sunny shininess of ed-tech solutionism which wants to sell you technology so you can share and like and score and learn (ha, maybe) more seamlessly. It wants to sell you an app (or two or three, plus hardware!) to download, all with the promise of a fix for education, an institution whose purpose we can't all agree upon, let alone all articulate if or how or why it’s broken. But it's broken, Silicon Valley repeatedly tells us. It's broken. So click here. Save it.